Imagine, for a moment, that you were a very irresponsible adventure travel agency? So irresponsible, in fact, that you send two guides with a group of tourists up to the summit of Mount Everest, knowing that a storm is coming. At least the irresponsibility is not your fault, the agency is sending the tourists up rather than giving their money back because of bad weather, you’re just trying to keep them alive now. We’re back in the Himalaya, but this time it’s not with professional climbers conquering K2, it’s with the guide team of Thrill Seekers, or maybe Summit Insanity, walking a group of adventurous middle management types up the presumably much safer Everest. This time, you’re not competing with other players, either. 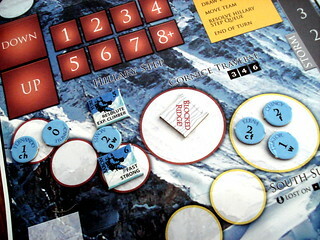 Disaster on Everest is a solitaire game where you control a group of six tourists and two guides on a peaceful stroll up one of the world’s highest mountains. You start out from High Camp in beautiful weather, with not a cloud in the sky. Every turn you move either both your guides, or one guide and two tourists, or you move four tourists and let your guides sleep in for a change. Tourists on their own move from zero to two spaces. Moving zero spaces is not very helpful, of course, that’s where the guides come in. Guides move up to six spaces on a turn and they may drag one client with them for two spaces. Except if they are fast, then they can drag someone for three spaces. Or if they are strong, then they can take two people. Some guides even have both traits, and we call them incredibly useful. So far, everything would be a walk in the, admittedly rather elevated, park. But before you get to move each round, you draw an event token. What you do with that event token is a very interesting dilemma indeed. You can just not to anything with it, in that case no event is triggered. Sounds good, right? Only that in that case, the token goes on the storm bar, and with six tokens there, the storm starts. Ten more tokens and the game ends and every client still on the mountain has a good chance to die in which case they won’t pay. So orders from management are to keep people alive. To hold off the storm, or slow it down when it’s already there, you can choose to buy the event token for prestige points of which you have 18 to start with and may very rarely gain two more when a Good Reviews event comes up. Here’s the kicker, though: some events are good for you, giving you extra movement points or helpful equipment, but those are mostly expensive to buy. Avalanches and other such fun diversions, on the other hand, are cheap and slow you down or even kill one of your clients outright, based on a die roll. Your decision is: take only the good events and the storm will hit you soon, delay the storm and suffer right now. 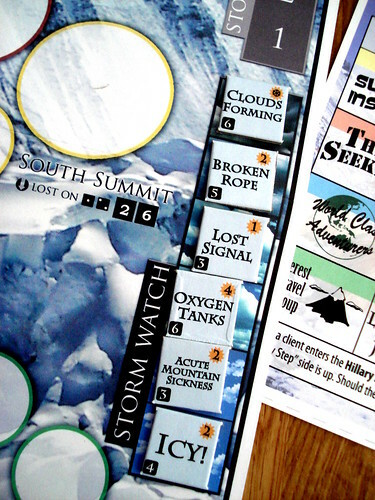 Whether you buy the event or not, most tokens will block one or more of the ridges – special spaces on the way to the summit – making them impassable on that turn. That’s very inconvenient, but fortunately an Expert Climber guide can take your clients past the block. Get them past those obstacles and two thirds up the mountain and you will reach the next problem: the Hillary Step. The Step, a 12m high rock wall, is not all that dangerous nowadays, there are ropes prepared to make the ascent possible even for amateur thrill seekers, but it can only be traversed one by one, it slows down your group. And that’s exactly what it does in the game as well, letting people climb up and down only based on a die roll. You should get all your clients above the Step, and preferably some up to the Summit, before the storm hits. Any client who hasn’t made it above the step by that time you should just walk down again or he’s not going to make it. Once the storm arrives, movement rules change. You may move all your guides and clients every turn during the storm, but even your guides may only move two spaces per turn and they lose their special abilities. Except if they are Resolute, in which case they withstand the storm. Now it’s time to rush all your clients down the mountain because after ten more unbought event tokens, the game will end. Hope you didn’t spend all your prestige yet. When the game ends, all that’s left is counting points. You get full points for any client that made it to the summit and back, only 4 points for every client that made it above the Hilary Step and nothing for all the others. Clients that got lost – based on a die roll on the ridges above the camp – or didn’t make it back to camp in time have a chance to survive on their own, but they also have a chance to die, giving you their point value in negative. That’s bad, but they’ll still be more upset about it than you. Victory or defeat in Disaster on Everest is based solely on the points you achieved – more than 40 is a victory, more than 60 is a miracle. That’s not as satisfying as other victory conditions for solo games, but it works here and puts a nice push-your-luck element into the game when you try to defeat your own high score. Next to that aspect, Disaster on Everest is all about optimization of your movements – my advice here is to keep the group together – and risk management between the event tokens and the approaching storm. It’s dry to start, but surprisingly motivating when you get going. There are unfortunately only two levels of difficulties. On the higher difficulty, your clients require individual special treatment. That option makes the game more interesting but harder to keep track of as the specials are only one letter on the client token that refers to the manual. The same goes for the event tokens, by the way: the token only has a name, the effect is to be looked up in the manual. Those things would have been better served with cards that fit all the text right there, but as before I won’t complain about Victory Point Games’ components, making them affordable and portable is what they do, you know that when you buy them. I still enjoyed Disaster on Everest, it’s a fun solo game to puzzle out. Usually, when a game tells you to create your own legend, it doesn’t mean you should kill the people participating in it. But when the game is named after the Greek underworld for heroes and demigods it was predictable that they would have to get there somehow, and the usual way is dying. But at least they will contribute to your legend and maybe help secure your place on Olympus. Potion delivery is big business. A bit like pizza delivery, only with more magic, and on broomsticks. That is your business in Broom Service, but the competition is tough and you won’t have time to let your brooms cool down before the day is over. So keep a close eye on what your opponents are doing and use your witches and druids to deliver the most potions before the game is over. Goblins no have bombs. That no good. Goblins need bombs. You Goblins will see bombs, will look at bombs, will learn bombs? Why? Because Big Boss Necromancer Goblin say, that why. Go learn bomb, not worry if bomb explode, Big Boss bring you back, no problem. Russian Railroads is a European optimization game, subtype worker placement. Every game, you try to do better than the one before, optimize your strategy and score a bit higher. But it’s not a typical game of the genre. Where you often have a lack of options in other such games, only one or two routes to victory which you try to use as well as you can, Russian Railroads gives you many different, viable ways to score. Its many moving parts create a fascinating whole that will let you find new ways to a higher score for a long time.